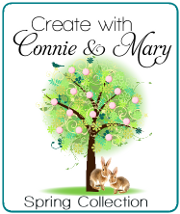 Happy Thursday everyone and welcome to the Create with Connie and Mary Thursday challenge! Today we have fun sketch challenge for you. I do have to say I took a couple liberties with the sketch but thought it ended up being a fun card. Stamp greeting using Versamark on Basic Grey, white emboss and cut with the oval framelits. Pierce around the edge of the oval and add to card front using dimensionals. Stamp the different triangle stamps using Basic Black, Crushed Curry and Bermuda Bay, punch with triangle punch and add to card front using dimensionals. Finish it off by adding some basic rhinestones.